The peak of summer has passed, and many students are slowly turning their minds to the upcoming school year. As back to school specials start hitting stores, many prospective students are hitting the books for graduate school entrance exams or poring over their scores from spring tests. The most pervasive general graduate school exam in the U.S., the GRE, recently released its scoring data for the 1.5 years since a major overhaul of the test in late 2011. Within the dataset, the ETS has grouped average scores by the test-takers' intended graduate major, inevitably contributing to the bragging rights of "major" elitists. So which majors reign supreme on the GREs? Let's have a look at the data for the test's three main sections: verbal, quantitative, and analytical writing. The verbal section measures a student's critical thinking ability, reading comprehension, and vocabulary mastery through a series of multiple choice questions. The questions require students to complete sentences with the most fitting word or phrase available and glean information from short passages. In the chart above, I've plotted the average score for several individual majors as a percentile of all scores. 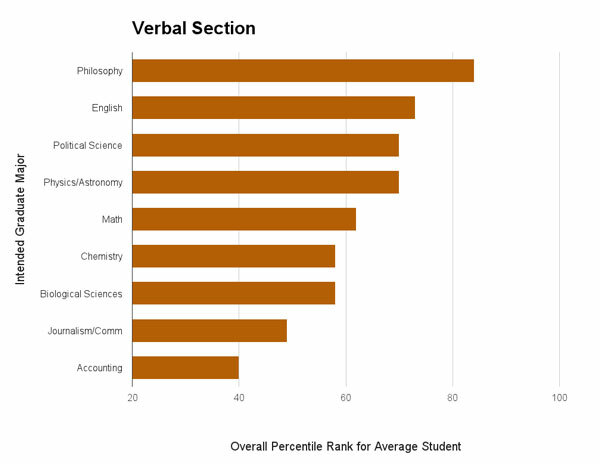 For instance, the average philosophy student's score (mean score) on the verbal section was 84 percent, higher than all of the scores across all intended majors. Philosophy outranked all other majors by a significant margin while physics students topped the charts among math and science majors. Ironically, journalism and communications majors performed worse than many science students on the verbal section of the exam. Math lies at the heart of the quantitative reasoning section. Most topics on this section should have been covered in high school with topics including algebra, geometry, and data analysis. Questions in this section prompt students to determine averages, use basic probability, recognize numerical patterns, and glean information from charts and graphs. Unsurprisingly, mathematics students shared the top spot, and physics majors tied for second with several other majors. According to data from only 2011 and 2012, math majors were tied with physics majors in this category, but they averaged one point higher for this data set. Predictably, most social sciences students scored lower than science and engineering majors with notable exceptions in economics and finance. The final third of the exam, the analytical writing section, has two essay prompts. One prompt requires students to pick apart logical fallacies (e.g. strawman arguments, circular reasoning, and ad hominem attacks) in a hypothetical written argument. The other prompt is much more open-ended, requiring test-takers to take a position on a short, general statement and argue for the position effectively. This section is graded in half-point increments from a scale between zero and six. Because the percentile ranks jump dramatically between the half-point increments, I've graphed just the raw scores for this section. 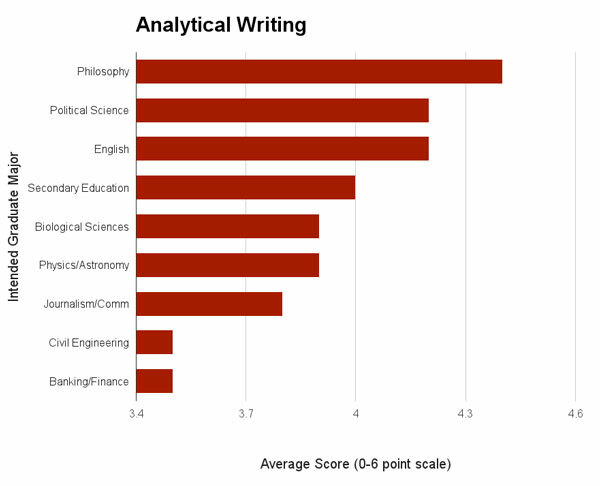 Once again, philosophy took the top spot, edging out political science and English students by 0.2 points on average. Physics students had a strong showing as well, beating most science and engineering majors and even several liberal arts majors such as journalism/communications. Before championing your chosen major as the most awesomest, smartest major ever, there are a few things to keep in mind about this data. First, this data tracks the intended graduate major, not the actual undergraduate major chosen by the student. Because some students choose a different discipline to study in graduate school, not all intended math majors were math majors during their undergraduate career, for example. However, in physics at least, the vast majority of graduate students have an undergraduate degree in the field. According to data from the American Institute of Physics, 94 percent of domestic physics graduate students majored in physics for their undergraduate degree. Also, correlation does not necessarily indicate causation. Just because physics majors perform extremely well on this exam doesn't necessarily imply that their physics education is entirely the cause. It's possible that physics departments attract some of the best high school students, and these students would have performed well on the GRE regardless of their major in college. Nonetheless, I suspect that undergraduate majors can play a significant role in determining a student's success on the GREs. Philosophy departments focus heavily on logical reasoning and identifying logical fallacies, most likely leading to philosophy students' dominance of the verbal and analytical writing sections. The relatively poor performance of students intending to study journalism or communication in graduate school surprised me. They performed worse than many science and math majors on not only the math-heavy section but also the verbal and analytical writing sections. Finally, not much has changed from last year's data, and physics students continue to perform strongly on all three areas of the exam. Philosophy students reigned supreme in two of the three sections however, suggesting a "love of wisdom" will serve you well. At least on standardized exams, that is. It would be interesting to see the average GRE scores of APS members. I would be very cautious about extrapolating these numbers to science reporters as well. Many had a technical background prior to moving to journalism. And in philosophy, we try to teach that it's "logic fallacy," not "logical fallacy." No fallacies are logical. Philosophers use the term 'logical fallacy' frequently, since the word 'logical' in philosophy means, most centrally, 'of or related to logic,' as in "logical atomism," "logical positivism,' "logical omniscience," "logical possibility," and so on. Another consideration is, which students are likely to take the GRE intending to go into these grad programs? I'm a philosopher and can testify that philosophy grad schools are extremely selective (and chances for a job in the profession are slim), and thus undergraduate advisors are unlikely to recommend anybody but the best students even apply. Whereas for say, journalism, undergrad advisors might be much more likely to encourage a merely-very-good student to try for grad school. I would be interested to see the numbers of people taking the exam from each discipline. I was a philosophy an English major and I crushed the GREs, with the exception of quantitative reasoning. Philosophy honed my analytical mind to be razor- sharp and, as the years go by, I am thankful for the agile mind such a "worthless" discipline has given me. It's really helped me in my career as a novelist. And all of those surveyed would be able to spot the silliness and the worthlessness of the "results". Oh wait, I put the period outside the quotes: I must be a philosophy major. Oh wait, I used sarcasm: I must be a fizix major. Oh wait, I spelled "physics" wrong--I must be an economy major. Oh wait, I used a colon in one sentence and a hyphen in another to do the same job: I must be an engineer. Oh wait, you ended the first paragraph of your summary, "Reflections on the Data," with, "there's a few things" when "a few things" needs "there are." I guess you ain't so smart after all, Skippy. 1. I've heard of economics majors, but what's an economy major? 2. Did you mean to say "em-dash" instead of "hyphen," or was that part of the sarcasm? I am a bit confused. Your axes state 'intended graduate major', not 'undergraduate major'. Are you not saying that students who intend to do philosophy outperform, which is a different thing from saying that students who have done philosophy outperform (not saying there is no overlap)? Yes you're 100% right about this. However, the overlap is significant. That is to say, those students who intend to do philosophy are almost exclusively people who did philosophy in undergraduate studies. This is simply because given both the competitiveness of the programs and the slow growth of the field, you have a very small chance of gaining acceptance unless you have a background in philosophy. Very few do. That being said, the philosophy students know this. I highly suspect (although I have no numbers to back up this claim) that only very highly qualified philosophy students actually apply to philosophy grad programs. So it could partly be why the numbers are so high. Not to say the student class in general isn't bright. When I was still an undergraduate, the only students with GPA averages lower than the philosophy kids were the engineering, physics, and math students. 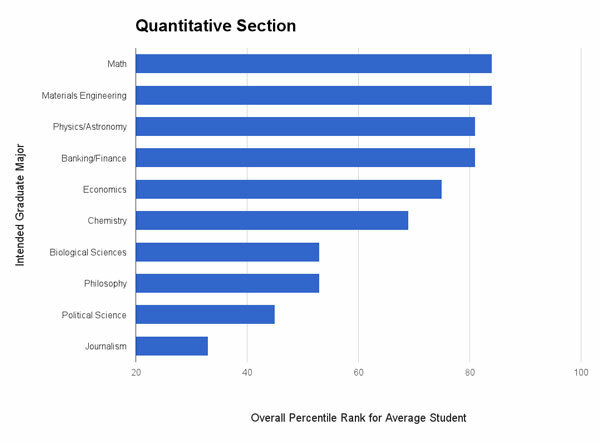 Philosophy majors also do very well on quantitative reasoning - note that they still took 8th place, even though most get little formal training in this field. Altogether, philosophy and physics majors both perform very well across the board. 2)serious ones who also have several other majors and are expected to know at least Calc and a lot on using math to puzzle solve, typically to CalcIII/Diffy Q, Linear Algebra and Real Analysis and explain it better than the mathematicians. Also most top philosophy majors go into computer science, medicine, law, and business. What do you call a philosophy major? Boss. Omg. You guys r such nerds. I wish it was a little more informative. Instead of insisting whose smarter. I know a lot of people with undergraduate philosophy degrees. I can't say I've been impressed with their reasoning skills. Every single one of them is working fast food. These aren't lazy people by any means. They applied for many professional jobs, but employers are just not interested.